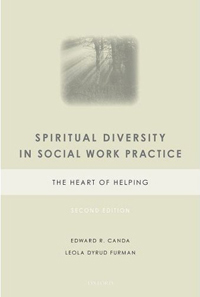 Spiritual Diversity in Social Work Practice: The Heart of Helping, 2nd ed. Many of the people served by social workers draw upon spirituality, by whatever names they call it, to help them thrive, succeed at challenges, and infuse their resources and relationships with meaning beyond mere survival value. This revised and expanded edition provides a framework of values, knowledge, skills, and evidence for spiritually sensitive practice with diverse clients. Weaving together interdisciplinary theory and research, as well as the results from a national survey of practitioners, the authors describe a spiritually oriented model for practice that places clients' challenges and goals within the context of their deepest meanings and highest aspirations. Using case examples and thought-provoking activities, this text illustrates the professional values and ethical principles that guide spiritually sensitive practice. It presents definitions and conceptual models of spirituality and religion; draws connections between spiritual diversity and cultural, gender, and sexual orientation diversity; and offers insights from various religions and theories. It guides professionals in understanding and assessing spiritual development and related mental health issues and outlines techniques that support transformation and resilience, such as meditation, mindfulness, ritual, forgiveness, and engagement of individual and community-based spiritual support systems.